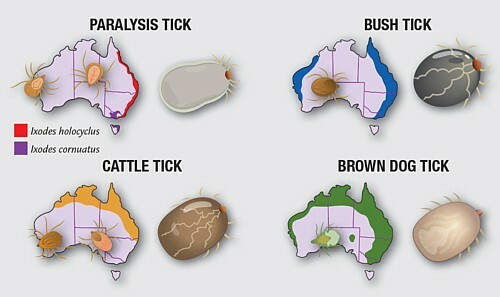 We’re about to launch into a tick season which promises to be a bumper crop – given the rain that has fallen over Australia this year. So here’s 5 facts (which you may not already know) to help you be prepared. 1. Ticks like penthouse spots – whilst ticks live on the ground they like to crawl up into bushes and up grass blades to wait for unsuspecting passers by (you or your pet). They will attach on to at any given opportunity, and then attack to get their feed. 2. Ticks are picky eaters. Once they have found you (their host) they like to travel around to find the spot where they get the most bang for buck. On humans they will travel upwards around the head, neck and ears where the skin is thin to make penetration easier. On pets, the groin area is a favourite dining spot. 3. Tiny ticks can cause big problems. After a glorious bush walk a couple of weeks ago, I woke up in the middle of the night with an itchy neck. I scratched him off, and it was hardly visible, but I could feel the result for weeks afterwards. Whilst that was a minor inconvenience, there has been a lot of research recently and the findings are that serious illnesses can be passed on by even the tiniest of ticks – and one single bite can cause a lifetime of issues. 4. Tick bites don’t get felt immediately. Tick’s saliva is like an anaesthetic so victims don’t necessarily feel the bit immediately. That’s why I was so surprised to find the offender a day later. So if you or your pets have been in an area that is prone to ticks be sure to check yourself and your pet very carefully – and ask someone you know to look at the places you cannot see to make double sure. 5. Extraction method is very important. A tick is filled with toxins. If you squeeze him, all that bad stuff comes out – into the pet or person that it is attached to. Try using tweezers (gently) and pick the tick off the surface of the skin. Some experts suggest killing the tick with an insect repellent, or similar substance and waiting for it to fall off. Prevention is always better than a cure, but if your pet is affected by a tick – or you suspect there’s a tick (symptoms include vomiting, wobbliness in the back legs, loss of appetite, difficulty in breathing and a change in the bark or meow) go immediately to your vet. If you do find the offending tick keep it for identification – and this also applies if you find a tick on yourself ! Remember too – some pet insurance policies include a benefit for tick treatment – Petsecure Pet Insurance (link to www.petsecure.com.au ) offers a $500 benefit each year for tick treatment – whilst you may think it’s the last thing you want, pet insurance is the first thing you need if there is a vet emergency!